Hi !!! I'm new to this forum. I really enjoy that Keith told me there's a forum here and I was VERY interested about these stuffs. I live in Indonesia (a country where Hayley's fan is hardly found ). But it's OK because I can be her no.1 and first (perhaps) Indonesian fan and now I've got to this website and I'll go around a little bit. Bye !! See ya !!! Thanks for your posting and welcome to the forum. I am very happy that you have joined us. 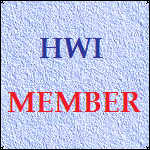 There's lots of Hayley information on HWI so, have a good look around and, if there is something you need to know, or something you are looking for feel free to ask. That's what we are here for. I am looking forward to reading your messages. Welcome to the forum. I hope you enjoy being a member and that you will return regularly to read the updated news and other posts. Why not tell us a little about yourself as an introduction. When did you first discover Hayley? Anything like that would be great. Welcome to the forum. Glad you came along and joined. You say you have become a dedicated fan of Hayley from what you have seen and heard so far. I have only one thing to say - you ain't seen nuthin' yet. When she hits the USA this time (she has been there a couple of times before), it will be like being hit by an earthquake that is right off the Richter Scale. She really is the most phenomenal singer I have ever heard. And, something I discovered last October when I went to London to be in the studio audience for a TV programme called "Loose Lips", her voice has not been engineered at all for her album. What you hear on the CD is exactly how Hayley sounds in real life. The time to April 6th will soon go. Just think of it from Hayley's point of view. Before then, she still has TEN concerts to perform - 2 in Japan and then 8 in the UK. The first in the UK is next Saturday. You know, the sense of anticipation is the next best thing to actually seeing her. I'm so glad that you've joined our forum. I live in the USA also. Hayley is virtually unknown here but all that is soon about to change! I was able to purchase the Pure CD from amazon.com about four months ago. It was the Australian release, but it's very similar to the US version. Also Hayley has released three other cd's; two of which are available for purchase. I haven't decided whether I will join i-squad yet. Hey, April 6th will be here in a flash...come back and visit here often...hopefully soon we'll all learn which cities Hayley will tour!! My name is Kirsty, I'm 18 and live in the UK. I was told about this website by various people and have decided to join! I adore Hayley's voice and I was given 'Pure' for Christmas after having heard it as soon as it came out, and I bought 'Hayley Westenra' a couple of days ago. I'm eagerly awaiting June when I get to see her perform at Hampton Court! ps. Hi to all I know from yahoo!! I haven't heard Hayley yet.... I'm downloding three of her songs now, but I've heard her mentioned on the joshgroban message boards, and thought if a Grobanite thought she was awesome (and worthy to do a duet with Josh haha just kidding) then I would, too! A warm welcome to you. I hope you like the forum and look forward to reading your messages. When you have had a chance to listen to some of Hayley's music, perhaps you will tell us what you think on one of the other message boards. I spent a lot of time obsessing over Charlotte Church, so now it's Hayley's turn. I bought the 12 track + 6 track bonus edition from ebay. way super cool. Welcome to the forum. great to have you her and I hope you enjoy being a member. So, how long have you been a Hayley fan? And, why not tell us a little about yourself. Welcome, Brent ! We have a lot in common, as I also love Charl and eBay! I've gotten quite a few items on eBay. Check out amazon.com for Hayley's self-titled CD. Come back here often or click the "Hayley Westenra International" link for breaking news on Hayley's TV apearances. I'm a 4th semester college student, 19 years old. I've been a fan for about 3 weeks, and I've had Pure for less than 2. I had heard of Hayley in the past, but could never find anywhere that sold her music. Then I browsed to her website and listened to the clips... yeah. My other musical interests are Charlotte Church, Josh Groban, Michelle Branch, Sarah Brightman, Enya, Becky Taylor, Jars of Clay, Relient K, The Corrs, and other various piano, violin, and classical. I like a lot of soundtrack music as well, such as John Williams, Hans Zimmer, James Horner, and Howard Shore. I would have to say that Hayley has one of the finest voices that I have ever heard. April 6th will hit the US like a storm. I've previewed my CD for about 15 friends, and so far I have about a 95% postive reaction rate. I'm glad to have found this fine website. I'll cya around.